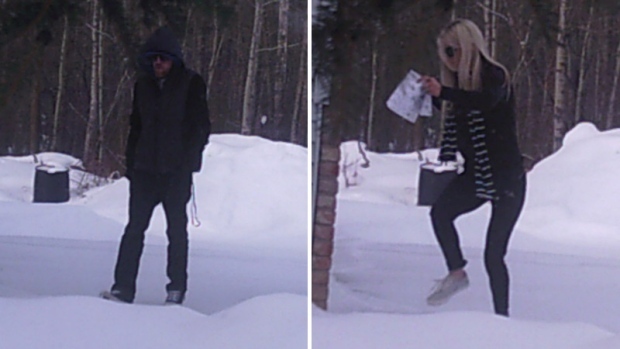 RCMP released photos showing two suspects in a residential break and enter in the area of RR 224 and TWP 513 on Tuesday, February 20, 2018. Supplied. Police in Strathcona County are trying to identify a male and a female suspect, after an attempted break and enter at a rural home Tuesday morning. RCMP said just after 10 a.m. Tuesday, officers were called to a break and enter at a home in the area of Range Road 224 and Township Road 513. Reports indicated a male had forced his way into the home, while a female suspect waited outside. Once inside, the male suspect was confronted by a resident of the home, and the suspects fled in a black Ford truck. He was last seen wearing a blue hooded sweatshirt and a dark jacket. She was last seen wearing a dark jacket, light sneakers and sunglasses. Anyone with details that could help investigators is asked to call Strathcona County RCMP at 780-467-7741, or local police. Anonymous tips can be submitted to Crime Stoppers by calling 1-800-222-TIPS (8477).